Traveling the world on a magic carpet sounds like a great first date to me! Check out the Aladdin and Jasmine costumes in this fun and fantastic DIY costume collection. Genie costumes pay tribute to the late and great Robin Williams. Whether a pint sized version or a stunningly accurate adult, the indomitable spirit of the genie is definitely captured. 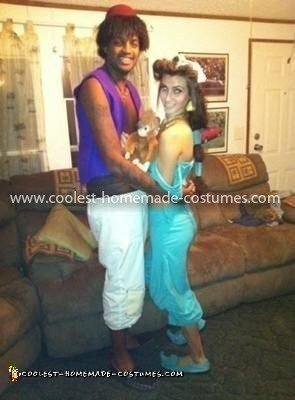 Also, if you have any parachute pants lying around, an Aladdin costume practically makes itself! We always prefer him to his Prince Ali doppelgänger. In addition, Princess Jasmine is always popular with the ladies. Both for the relative ease of her outfit and the instant recognize-ability she brings. Feel free to cover up as much or as little as you like. Most of all, the real star of this section are the floating magic carpet optical illusion costumes. If you want to really stand out this year, consider making one of your own for Halloween. If you’re still stuck for costume inspiration, we have plenty more Disney movie costume ideas. For instance, this awesome collection of The Little Mermaid costumes is a must-see!.